Mail on the Mark supported Maine Startup and Create Week by leading the email marketing and ensuring it went out in a consistent and strategic way. The e-newsletters were the most effective channel for promoting ticket sales and we were able to use the same platform to stay in touch with attendees the week of the event. Maine Startup and Create Week is a week-long event in Portland, Maine focused on attracting high-growth entrepreneurship to Maine. The volunteer-led conference had used e-newsletters sporadically in the past, but needed to be more consistent with their approach in 2016 to stay in touch with those interested in attending and/or volunteering at the event. The e-newsletter’s goal was two-fold: first to drive ticket sales and secondly to keep ticket-buyers informed of details about the event. Mail on the Mark was used to send information about the 2016 event to past attendees, prospective ticket-buyers, current attendees, speakers and volunteers. Our team helped write content, edit content, design key graphics and keep the newsletters going out on a consistent time line. We also integrated with Zapier to generate an automatic email response after tickets were purchased. The email marketing program drove more ticket sales than any other marketing channel for the event. We nearly doubled the total number of e-newsletters sent from the prior year, while using segmented lists to ensure we didn’t oversend to targets. 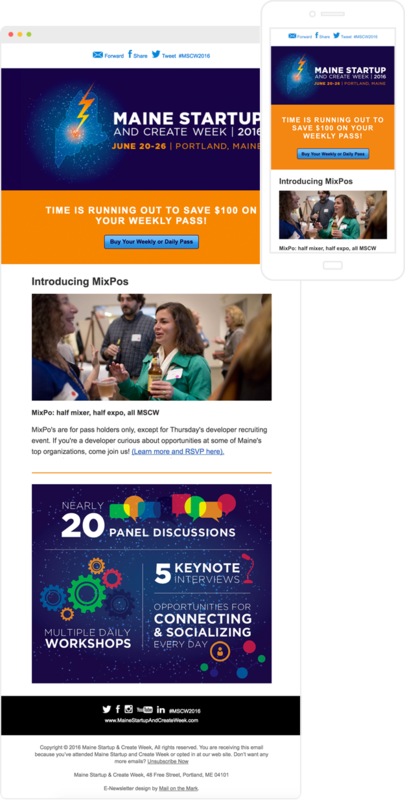 Once the event started, the newsletter quickly became an attendee experience tool as special announcements and recaps were delivered on a daily basis to all attendees. Email became their number one driver of tickets sales compared to any other marketing activity. By segmenting ticket buyers from non-ticket buyers, we were able to continue marketing to non-buyers while sending updated event details to attendees. We synced with their ticket registration platform to send up-to-date information to each new ticket buyer.